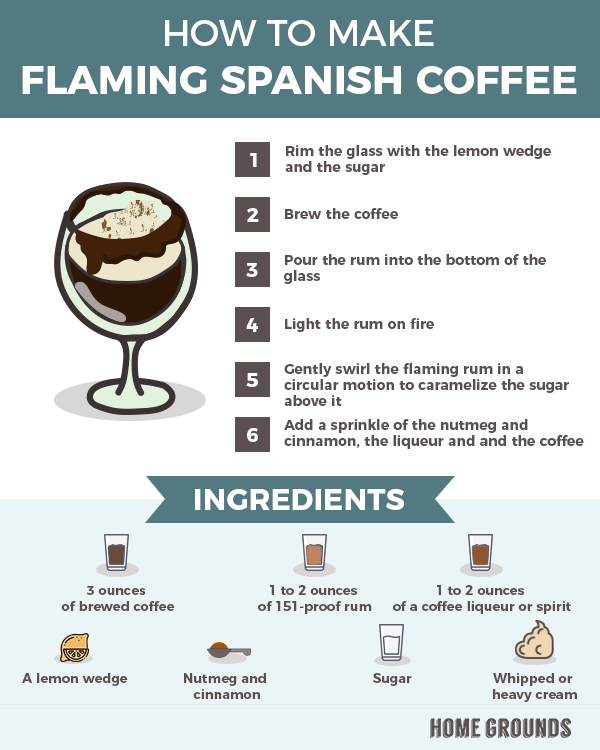 There are many different takes on Spanish coffee, but the general idea is a drink made with coffee liqueur, rum, and coffee. If you want to enrapture your friends with a fiery performance, whilst simultaneously benefitting from the boost of a coffee and the kick of a stiff drink, this is the recipe for you. Pour your choice of sugar into the shallow dish. Take a lemon wedge and use it to rim the glass. Put the rim of the glass into the sugar to get a good, even coating of sour-sweetness. Pour the rum into the bottom of the wine glass. Take the glass with the rum in it, tilt it roughly at a 45-degree angle and light the rum on fire. Use your index and middle fingers to grab the stem of the glass and gently swirl the flaming rum in a circular motion in order to help caramelize the sugar above it. Add a good sprinkle of the nutmeg and cinnamon, then quickly add the liqueur to the rum and the coffee. Optional: top your drink with the cream, whipped cream, or both along with a bit more of the nutmeg and cinnamon.